Episode 8 of Jigoku Shoujo Mitsuganae, “Neighbor”, starts off with a middle-aged woman just buying a bracelet from a home shopping channel. A few days later when Yuzuki is coming back from school, she sees Kikuri chasing down a chihuahua dog. When Yuzuki picks up the dog, Kikuri demands it, saying that it would look delicious with some seasoning. While Yuzuki is bewildered, Yamawaro pleads her to get away from the seemingly silly girl. The first half of episode 7 of Hyakko, “Hundredth year since meeting of fox and tiger”, starts off with Yanagi, the capitalist from episode 5, and Koma ready to enthusiastically take new pictures for the new season, as new demand is created with the switch to summer school uniforms. A bored friend of Yanagi’s comes across them, who has a really sinister-looking face but probably not so evil in reality, and he joins them to amuse himself. His name is Kitsune, which Koma finds to be an odd name, but Kitsune could say the same about hers. Episode 7 of Jigoku Shoujo Mitsuganae 7, “Liar”, starts off with a new transfer student, Inuo Atsushi, to a neighboring class of Yuzuki’s. Outwardly, he seems to be a pretty great kid that soon becomes popular with everyone, with great manners and good at sports. The odd circumstances of his transfer, odd because he transferred during the last year of middle school, is explained by his sick mother. The mother had to move to the country to convalesce from an illness, and with his father unable to come because of work, Atsushi had to move schools and take care of his mother. Episode 7 of Shikabane: Aka, “Soul of False Words”, starts off in a subway, where a group of teenagers are disruptively loud as someone is ominously typing words in a computer. And one of the words typed is that the author will administer justice against those who commit evil. This is soon borne out by actual action as a creepy young guy wearing glasses approaches the group of unruly teenagers that just got off the subway, and when one of them tries to punch the guy for being an annoyance, the attacking teenager instead ends up falling on the subway tracks. It’s real unfortunate for him, as he is promptly crushed by an arriving subway. 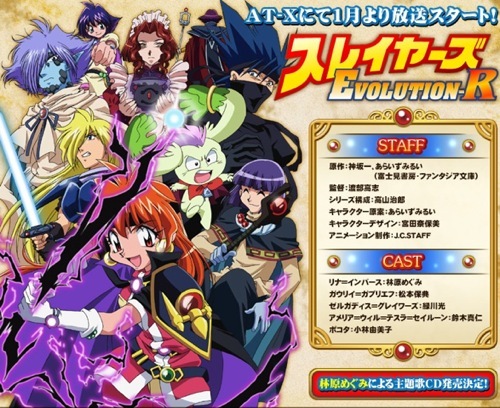 It’s official now (actually a couple of weeks now, I’m a little slow on the update): Slayers Evolution-R will be broadcast on AT-X in January next year. We’ll finally get to see the other half of the plot started by Slayers Revolution. And the theme song single CD by Hayashibara Megumi has already been scheduled for sale, which is another thing to look forward to. Episode 6 of Jigoku Shoujo Mitsuganae, “My Teacher”, starts off with a lone girl in a street connecting to the Jigoku Tsushin with her cellphone. Once connected, Kikuri appears and gives the girl an eyeball, obviously in reference to Ichimoku Ren. The episode then pans to the opening sequence.